The Essence of Autumn: So tasty! – Happily After Retirement! The Essence of Autumn: So tasty! I love the colors, smells and sounds that nature releases and the cool morning air and chilly nights. I smile at the wilting plants, herbs gone to seed and unpicked goodies. I welcome the new apples, laden with juice and flavor. I picked apples last week. This year Colorado had a bumper crop of apples, pears, peaches … you name it! I visited an orchard and picked to my heart’s content. As I was driving to the weight station, I found another stand of trees just begging me to pick, pick, pick! And, I did. The Honeycrisp apples are small this year but the flavor just drips out of them. Trust me on that one. Thirty two pounds later I am happy to say I am eating 3-4 apples per day. I also plan to go back and get more. I can put some in my freezer, make applesauce, or give them away. To me, apples are the essence of Autumn. Soon the Western Slope Peaches from Palisade, Colorado will be delivered to our community and my oh my … Move over apples! There will be no room in the fridge for anything else and that’s ok! Next Fall Dieting: Apples, Tomatoes and Basil, oh my! This summer’s hot, dry weather hasn’t exactly been kind to fruit, but it has given us great flavor! I remember last year, when we had record rain, that the peaches were tasteless – very very juicy, but no flavor at all. This year, they’re delicious. You have to love Autumn…cooler weather…fall fruits …craft bazaars…walking in the woods…leaves falling…making soups and chili…Oh, yes …Mother Nature shows off during this time! Oh yes … garden soups, warm sweaters, crisp air! Bring it on! And the apples are much smaller but oh my – so delicious! Off to Oman! Not many people can say that. What an adventure life has served up for you! One thing about eatin’ all those apples Marge, no gettin’ stuck in the doctor’s office. Yummmm I love apple season. I love the harvest, love the colour of autumn but not the cold mornings and the winter that will follow. Oh, if we were only at a buffet table, huh? This made me smile. 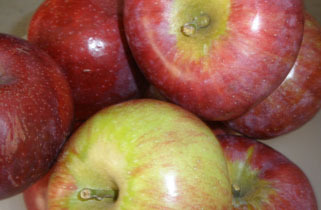 My sweetie came home, today, with 2 bushels of apples from the Annapolis Valley. Yum. Fresh MacIntosh apples; from the tree, a quick polish on my shirt, and the first big bite! I love the autumn! There is something that is so precious about a fresh picked tasty apple! And a Macintosh one too! Yum is right! I made some applesauce last week and will get some prepared for the freezer this week. It’s all SO good!